Size: 2,305 sq. ft. "Finished areas main & basement"
Pride of OWNER and good WORKMANSHIP because quality of renovation makes a huge the difference! 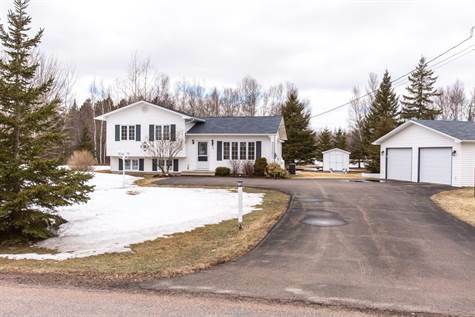 This well designed 4 Bedroom FAMILY HOME with 2.86 acres offers a peaceful treed backyard with a large DETACHED GARAGE located just walking distance to small beach; or drive five minutes to Parlee Beach, located near Grand-Barachois. Lots of DAYLIGHT in EVERY ROOM in this house as well in the FAMILY ROOM down stairs! PROFESSIONAL RENOVATED in the past few years as follow: New ceramic floor tiles for the entry way, kitchen & bath, new counter top & new hardware. New hardwood stairs. Roof is only 2 years old/35year shingles. The laundry area has been redesigned with a new half bath/new drywalled and more insulation added, offers a walk out to the backyard. The NORTIC 3 phase geothermal heat pump is only 4 years old. No worries any more about power outage the PROPANE GENERATOR is hooked up to the electric panel & set up to work automatic: winter is now fun! Basement has been foam prayed & insulated; it reflects a well-organized clean utility room. The 32x24 feet Garage is 2x6 constructed insulated drywalled has a wood stove & garage door opener. Large paved driveway – paving is 4 ½ inch thick. THE HOUSE IS Tongue & Groove Built. Two Storage Barns included. BEAUTIFUL LANDSCAPE with 5 perennial flower beds. The Property has two PID numbers with a potential building lot! Call to offer!